Lt. Col. Candis A. Olmstead | AKANG, Staff Sgt Edward Eagerton | Alaska National Guard Mar 24, 2015. JOINT BASE ELMENDORF-RICHARDSON, Alaska — Airmen with the Alaska Air National Guard’s 210th and 212th Rescue Squadrons rescued a stranded hiker near McHugh Creek, outside of Anchorage, just after midnight, early Sunday morning. The hiker had wandered off the trail and was unable to continue due to nightfall and terrain. According to Carte, the woman contacted the Alaska State Troopers via cellphone. Using a compass app on her phone, she was able to give them her coordinates. “Troopers and a family member were unable to reach her on foot,” he said. 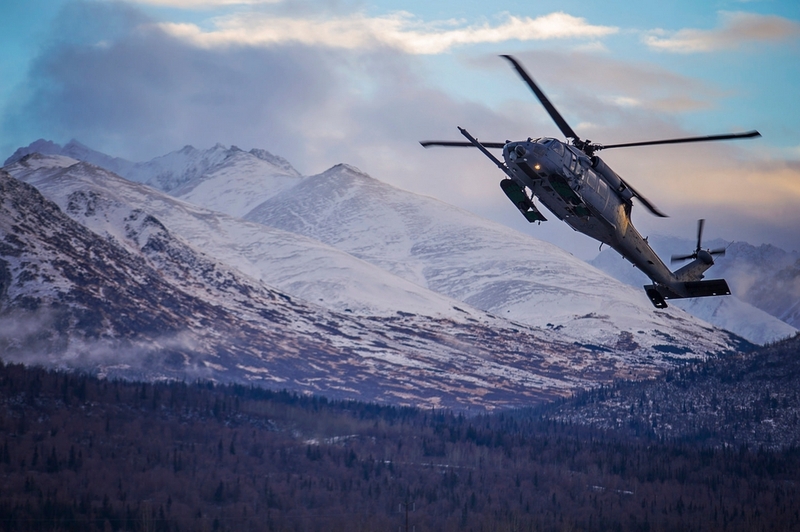 Due to steep terrain and nightfall, the AST requested assistance from the Alaska Air National Guard because of their night vision and hoist capabilities. The AKANG accepted the mission at approximately 11:45 p.m. Saturday night and launched an HH-60 Pave Hawk helicopter from the 210th Rescue Squadron with a team of Guardian Angels from the 212th Rescue Squadron on board, out of JBER. “They located her immediately with the GPS coordinates she had passed to the Troopers,” said Carte. Because of the terrain, the rescuers hoisted the uninjured woman into the helicopter using a rescue basket. Afterwards, she was transported to Providence Hospital where she was released to the AST. Carte recommended that hikers take a 406 personal locator beacon with them when venturing out into the wilderness, even on shorter day hikes. These devices enable a distressed individual to activate an emergency transmission that can be instantly detected by geostationary satellites, which then relays coordinates of the user’s location to rescue coordination centers like the AKRCC who can then act quickly to investigate and initiate a rescue effort, greatly improving an individual’s chance of recovery.